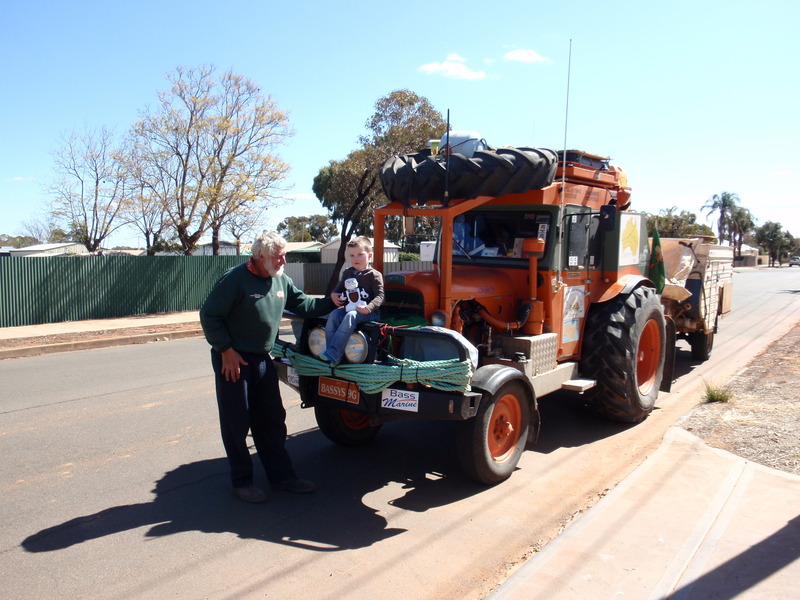 Day 63 – 3rd September, two months to the day since we left Dongara – we took an orientation/information tour of Broken Hill and surrounds which we all agreed was great value giving us a fairly good insight in to the City. One point that ‘came home’ strongly in Broken Hill was how the old style cottages and buildings of corrugated iron and pressed tin had been maintained to that day. In parts it was almost like a step back in time. By 2pm we were ready to leave the City in the hope that we could ‘make a few k’s’ ahead of the threatening skies and feel of rain. We headed in a south west direction towards Yunta on the Barrier Highway. We had discussed slightly shorter routes off the highway but with so much talk and information of threatening conditions it was agreed that the highway was the best alternative. As we approached O’Lary the heavens opened and the rain bucketed down. For the Bass’s and Allan it was agreed that a room at the O’Lary Hotel would be the way to go and Cedar would ‘pop’ his tee pee closely alongside the Hotel. O’Lary was another of the little country hotels that rely so much on passing tourist trade. Once inside we found that the business was being run by the family whilst Dad was away for the night on medical grounds. Just after we arrived there and had checked in for rooms and dinner there was a telephone call seeking meals and accommodation for about ten people returning home in their army trekking vehicles. This group were about 45k’s out experiencing the torrential conditions that we had. Then three other travellers also arrived seeking shelter and meals because of the stormy conditions. An amazing family unit swung into action taking it all in their stride and making a group of travellers VERY happy. O’Lary will certainly be remembered as a special place for this group of 9G trekkers. If you are ever passing, pop in and say hullo to the O’Grady’s on the Barrier Highway. When we woke the following morning we were told that there had been 4.25 inches of rain in the downpour and overnight as well as strong winds as forecast. Day 64 – Following a beautifully prepared breakfast at O’Lary, we farewelled the O’Grady’s and the army trekkers and took to the highway again. Straight away we were on to fast flowing creeks and water all around us. The skies overhead were very black and the wind continued to blow very strongly – all as forecast. Our travelling was somewhat slower but still allowing us to ‘knock over’ some k’s. 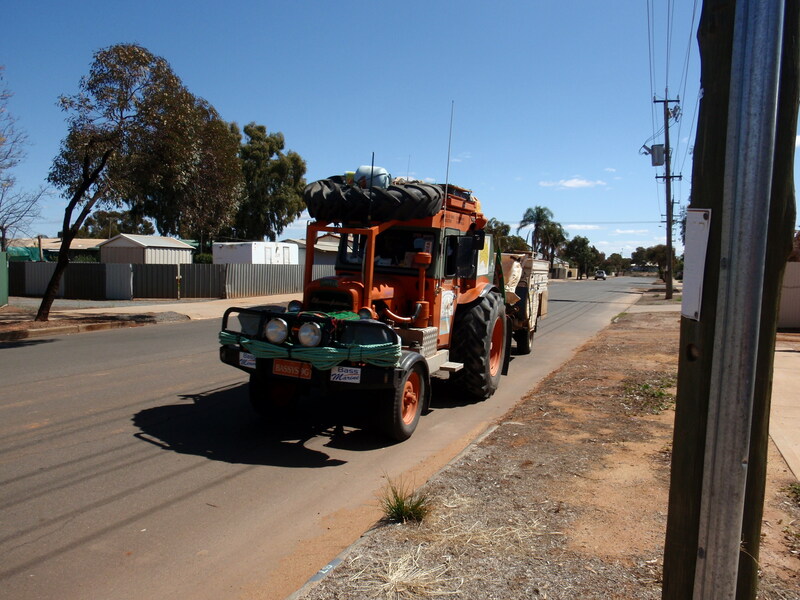 We passed on through Mannahill, Yunta and Oodla-Wirra during the day. Just before Yunta Allan did a front wheel bearing and whilst we were lucky that the rain had currently stopped, the repairs were carried out in 40+knot winds with a pretty high chill factor!! The repairs took about one and a half hours after which we were back on the road again. Most of the day’s travel was through rolling hills and beautiful looking pastures although a bit hard to really enjoy given the weather conditions. A break at Peterborough for a warm cuppa and a bite to eat was very welcome by all. Conditions had continued to deteriorate and it was agreed that the wind speed would now be in excess of 50knots. We still decided to continue on passing through Orroroo before reaching Wilmington where Allan and the Bass’s again took a room at the hotel and Cedar parked alongside. Day 65 – Fathers’ Day – we headed out of Wilmington at about 7.30am making for Port Augusta. 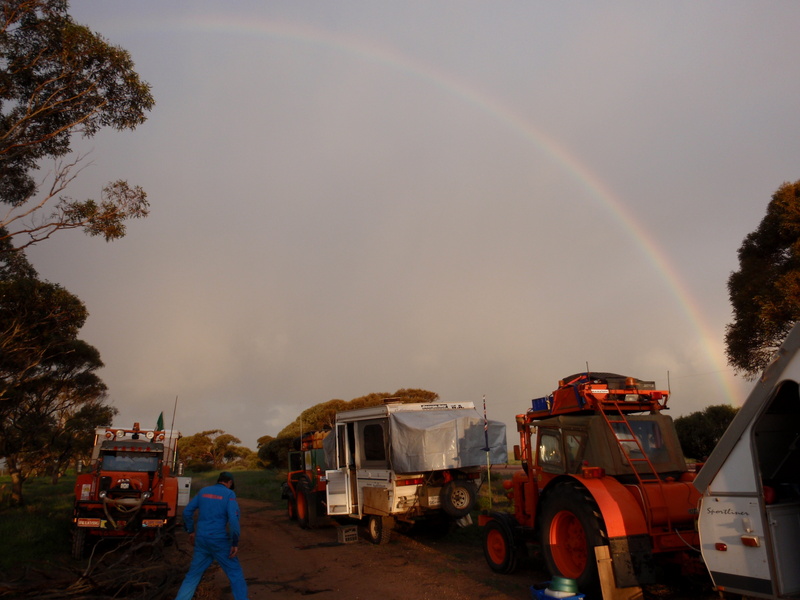 The skies were still overcast but looked like taking a clearing trend – we hoped!!! As we drove through the beautiful hills of the Mount Remarkable National Park there was fog in the valleys and the chill in the air was pretty high – Cedar and Allan in particular had to be well rugged up. Having said this it was magic scenery to start the day in. Some reminiscing of the 2004 trek was done as we passed through this area and other parts of South Australia. On reaching the Highway 1 junction the view of Spencers Gulf was a pleasant change. Fuel (for tractors and bodies!) 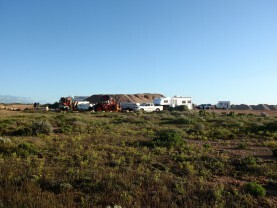 was taken at Port Augusta then we were off again at about 9.30am. Being an exceptional season our travels for the day took us through rich cropping areas and beautiful rolling farm land. Small towns on the way all had stories of floods experienced in recent days but again nothing that put barriers in our way. We passed by Iron Knob, Kimba, Kyancutta, Wudinna and on to Poochera. 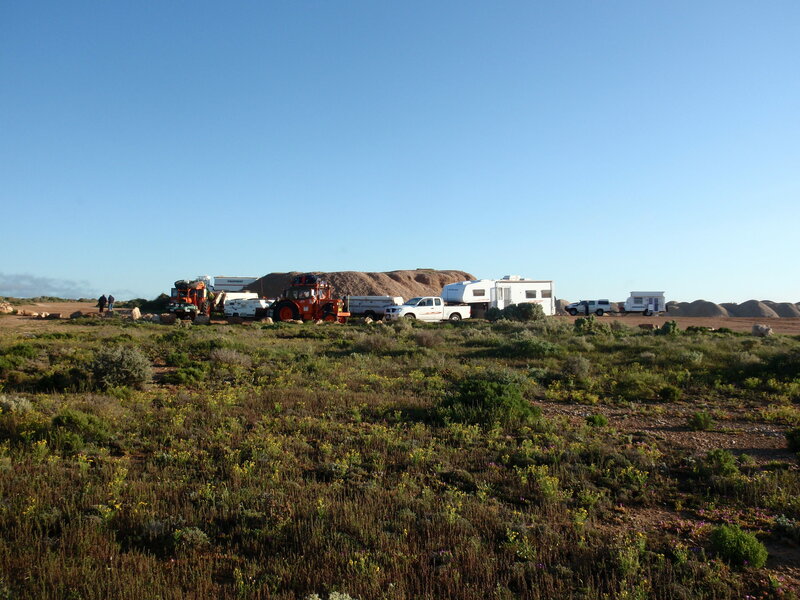 Around 40k’s from Streaky Bay at Chandada, having now done a total of some 8940k’s since leaving Dongara, we decided it was time for another bush camp. Given the rain, we were cautious of going too far off the road but found a great spot on a side track that suited us to a ‘T’. We set up camp in a slight drizzle but from there on the night was fine. Day 66 we decided to pack up and head in to Streaky Bay for breakfast before continuing on to Smoky Bay to say hello to club member George Baldwin. After meeting up with George and attending to some required tractor chores, completing and emailing report No 5 and picking up some famous ‘Smoky Bay’ oysters, we decided to ‘make a mile’ (we all agree that it sounds better than ‘make a kilometre’!!). So with goodbyes said we were on our way at 3.15pm. George was thanked for making us so welcome as usual; we all would have loved to have stayed but really needed to keep moving west. We went on through Ceduna and stopped for fuel at Penong. As we were about to leave, it was noticed that Bassy’s 9G had a split in the rim of one front wheel. With a ‘ready to use’ spare being carried, the necessary change was made and we were soon on the road again. A few k’s out of Penong we found a suitable campsite at the roadside. Allan soon had the camp oven on the coals with our dinner under way and George prepared oysters for an entree`. Another 9G Club Member, Phil Price from Penong and his friend Damo caught up with us and delivered a lovely lot of mallee roots for our evening camp fire. Thanks for the gesture Phil and Damo. Glad you could stay and enjoy the fire with us all. Day 67 dawned and guess what – condensation again! Gee we loved these mornings!!! A quick wipe down and out with the plastic sheets to cover the beds and we were all packed up okay. There was no point in waiting for the sun to dry the campers out because whilst not wet, it was a bit cloudy with certainly no real sign of the sun. Our first stop for the day was at Nundroo road house where we met a lovely (very generous) group of tourist on their way to the whale watching centre. They were travelling in a coach from the town of Butte, South Australia, on a five day tour. What a pleasant, happy group of folk to meet and chat with. As we travelled this first leg on to the Nullarbor, the green pastures continued and even the bush land glowed but it wasn’t very long before the land took on a “wide open spaces appearance”. Our next stop was at Nullarbor road house where we met up with a motor bike riding group who were riding to raise awareness of depression and its consequences. 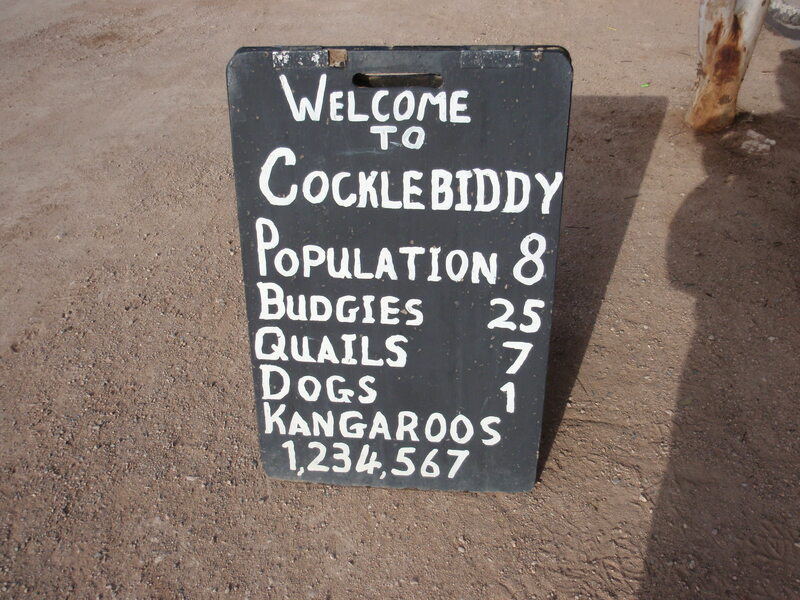 Since getting on to the Nullarbor there had been very little in the way of ‘road kill’ – one wombat and one kangaroo. Live wildlife consisted of two dingoes despite the caution signs warning of kangaroos, wombats, dingoes, camels etc!! As the afternoon went on the clouds became heavier with a slight/very light shower of rain falling and the winds became quite strong. Later in the afternoon we found a good camp site near a gravel dump (obviously placed for some up and coming project.) 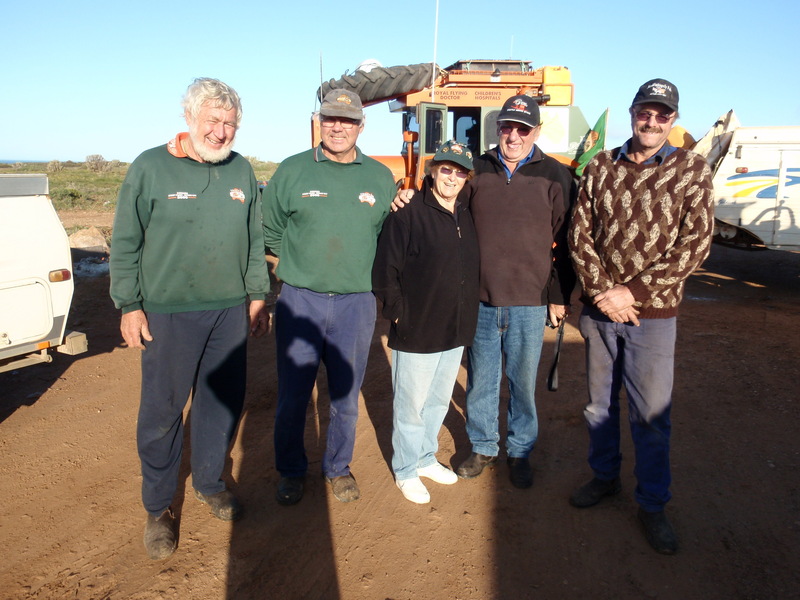 Once we were set up we were joined by Chas and Sandra from Queensland’s Sunshine Coast who were heading to WA to tour the Pilbara, the West Coast and South West of our State. Then we received a telephone call from Peter & Brenda Barr who were returning home. They were about 1.5hrs behind us and said they would join us a little later in the evening. This they did giving us all another great opportunity to catch up on events of the last few weeks since we farewelled each other at Birdsville. On day 68, as our camp was only about 100yards from the cliff edge, we woke to a beautiful view of the waters of the Great Australian Bight. There was a chill in the air but no sign of rain. After breakfast we said goodbye to Chas and Sandra and continued west towards the South Australian/Western Australian border some 20k’s down the road. Once through the border check we went on to Eucla to enjoy one last coffee and chat with Peter and Brenda before they went on ahead of us on the last leg of their journey back to Esperance. 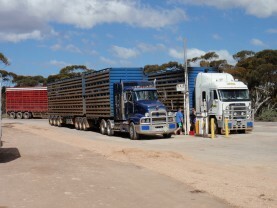 Travelling on the Nullarbor we became aware of the many road transport trucks carting sheep from WA to the Eastern states because of the lack of rain in the south of our State. After having seen so much water throughout the country it was hard to believe that some parts of our own state had missed out once again. The weather for the day was looking good but from all reports there were warnings of more fronts coming from the West. At this late stage of our trek we hoped we would be lucky enough to miss anything really bad! After Mundrabilla some ‘wag’ had been busy decorating trees!! We passed quite a number that had been done with all sorts of paraphernalia – undies, shoes, shirts you name it and it would be sure to have been part of the ‘display’! Guess that could be called ‘passing the time of day in the outback’. We continued on through Madura and Cocklebiddy with very little to report. Wildlife, be it dead or alive was almost nil! We could only assume that there was so much green feed and water for as far as the eye could see that the animals did not really need to frequent the roadside. 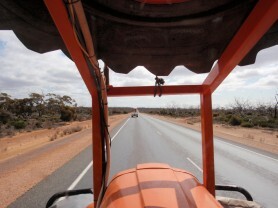 Also gone were the days of little or no traffic on the Nullarbor. Now apart from heavy road haulage of all shapes and sizes – very big business all throughout our vast country, there were the tourists/travellers in all manner of vehicles – campers, caravans, four wheel drives, cars and so on it goes, everyone being on a mission. Our overnight camp was about 5k’s east of Caiguna. 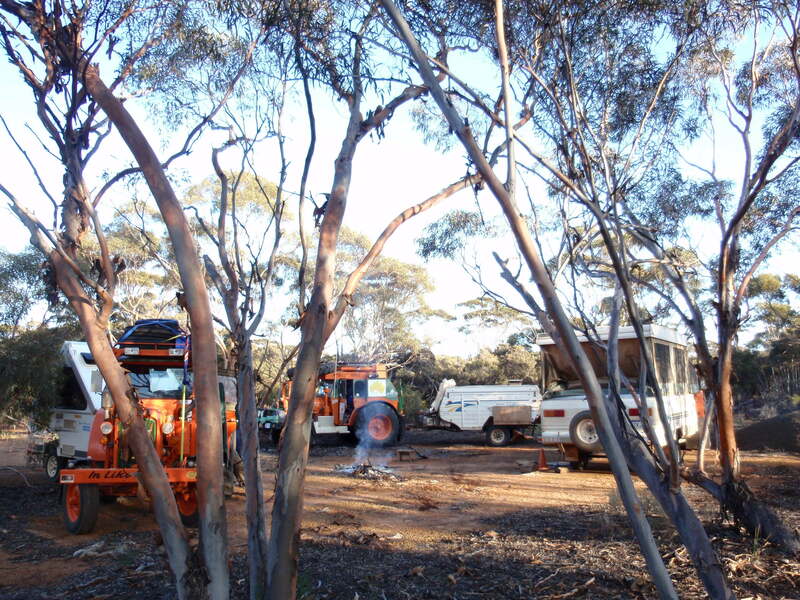 Day 69 we were up and ready at 6.30am (WA time) although we did not leave camp until about 7.30am after some minor repairs to the winding mechanism on the Bass camper. 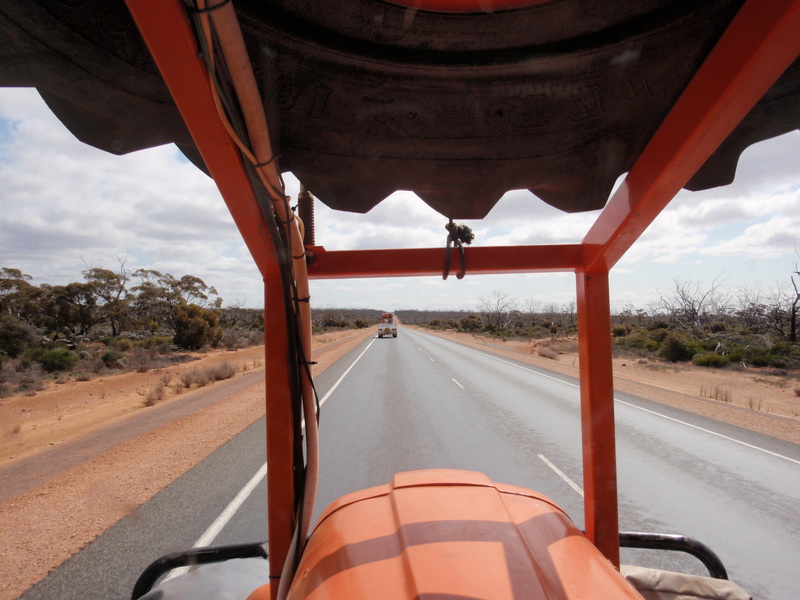 Once we left camp we were on to the longest straight road in Australia – some 146.8k without a single bend. We enjoyed lunch at Balladonia then arrived in Norseman at 4.40pm. After fuelling up we turned north towards Kalgoorlie. 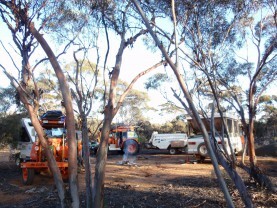 Having done a total of 402k’s for the day, we made camp 162k from Kalgoorlie. 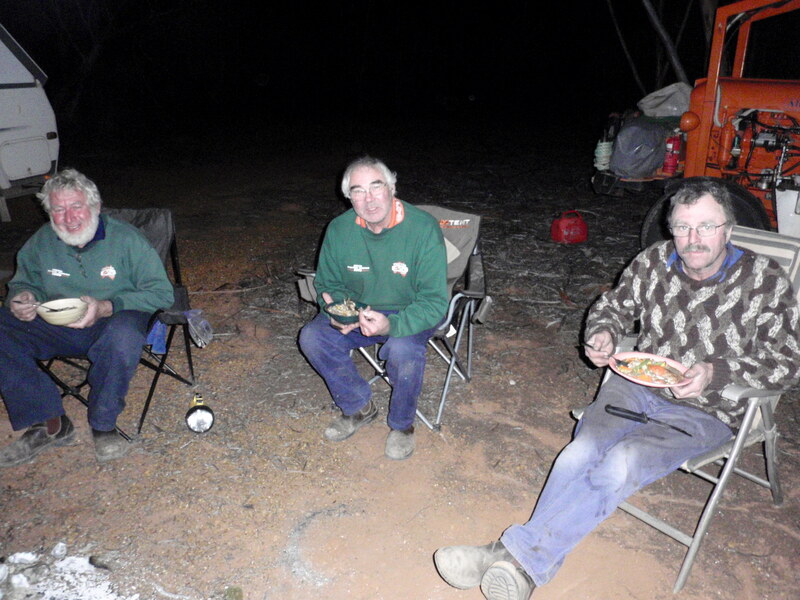 After so many weeks together and with such wonderful challenges and accomplishments behind us, this would be our last bush camp as a group because on reaching Kalgoorlie, Cedar and Allan would head south and the Bass’s would head north back to where it all began. That night there was lots of reminiscing around the last campfire reflecting back on all we had seen and done together. We also discussed the ‘outcome’ of the damper competition and it was decided that a ‘draw’ would be the best result because it was beyond any of us to say who really made the best one – or was it that we did not want to take the responsibility of making the final decision!! !